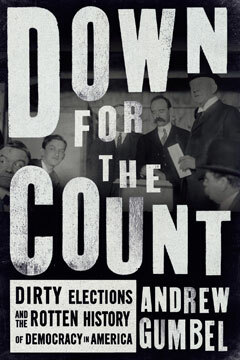 Down for the Count explores the tawdry history of elections in the United States—a chronicle of votes bought, stolen, suppressed, lost, miscounted, thrown into rivers, and litigated up to the U.S. Supreme Court—and uses it to explain why we are now experiencing the biggest backslide in voting rights in more than a century. This thoroughly revised edition, first published to acclaim and some controversy in 2005 as Steal This Vote, reveals why America is unique among established Western democracies in its inability to run clean, transparent elections. And it demonstrates, in crisp, clear, accessible language, how the partisan battles now raging over voter ID, out-of-control campaign spending, and minority voting rights fit into a long, largely unspoken tradition of hostility to the very notion of representative democracy. Andrew Gumbel has interviewed Democrats, Republicans, and a range of voting rights activists to offer a multifaceted, deeply researched, and engaging critical assessment of a system whose ostensible commitment to democratic integrity so often falls apart on contact with race, money, and power. In an age of high-stakes electoral combat, billionaire-backed candidacies, and bottom-of-the-barrel campaigning, there can be no better time to reissue this troubling and revealing book.